There are many people involved in Saltaire's success. The first, of course, was Sir Titus Salt. But the story doesn't end there. The Silver family is very much a part of Saltaire. Jonathan Silver rescued Salts Mill from dereliction, but sadly died in 1997. His spirit in Salts Mill is very much alive. Read David Hockney's tribute to Jonathan, his friend, who brought Hockney's world-famous art to grace Salts Mill. Jonathan Silver was a Bradford-born, successful entrepreur with phenominal energy and creative insight. He bought Salts Mill in 1987 when the abandoned Mill had ceased to function as a textile manufacturer and had fallen into serious disrepair. For ten years, Jonathan worked tirelessly, transforming the Mill into a space of enterprise, art and culture. Salts Mill houses the largest collection of David Hockney's art, in the world. In 1997, at the age of 47, Jonathan died of cancer. Salts Mill contines to thrive under the care and management of the Silver family, headed by Jonathan's widow, Maggie, and Jonathan's brother, Robin. Jonathan's life story is told by Jim Greehalf in his book, Salt & Silver, A Story of Hope. David Hockney's acticle, King of Salt's Mill, pays tribute to his friend, Jonathan Silver, who bought a near-derelict Salts Mill in 1987 and transformed it into a place of enterprise, art and culture. It was written soon after Jonathan's death in 1997. 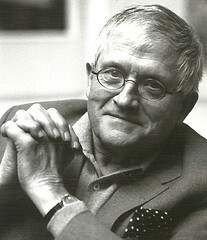 Many thanks to David Hockney for allowing his article to be published on the Saltaire Village Website. 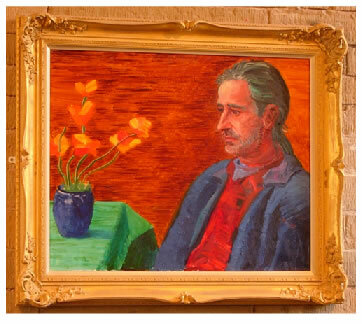 David Hockney's portrait of Jonathan Silver. I FIRST met Jonathan Silver in a Wimpy bar in Bradford in the early 1960s. He was a schoolboy at Bradford Grammar School and had written to me (in a lively and cheeky way) asking me for a picture for his "alternative" school magazine. I responded to his cheekiness and after that we never lost touch with one another - even though I lived in Los Angeles and Jonathan seldom left the north of England. He studied art history with Lawrence Gowing (whom he revered) in Leeds, and then went into business in Manchester - first in the rag trade and then dealing in furniture and prints. He used to tell me in the 1980s that he was one of Mrs Thatcher's new capitalists, thinking he was shocking me. But I understood perfectly well what was going on, and politics became one of our favourite subjects for phone conversations. Then he decided to sell up and travel the world with his wife, Maggie, and daughters, Zoë and Davina. They lived for a while in La Jolla, a town north of San Diego, and occasionally Jonathan would come up to see me in Los Angeles. It was in 1987 that he telephoned me to say that he was back in England and had bought Salt's Mill at Saltaire. It was a place both he and I knew well - we'd both been born and brought up a few miles away. Today, my brother's office is about half a mile from the mill. On Bank Holidays in the 1940s and '50s we usually went to Saltaire, walked past the busy mill, over the canal and the River Aire to take the Shipley Glen tramway to the top of the glen. You could then walk miles over the moors without touching villages or seeing anybody. Salt's Mill is a vast place, an old textile mill built in 1853 by Titus Salt from local stone and with walls 4 ft thick. I've no idea what he paid for it, but his main problem seemed to be what to put in it. There are simply acres of enormous rooms. But Jonathan began to use his awareness of his own mad vision, and from then on I talked to him three times a week. He said he was planning a gallery. I was amused or at times amazed by his audacity. Then, on my first visit, I was immediately impressed by the way he'd hung pictures in a room 200 ft long with essentially no walls. (They were all windows.) The rooms developed on each visit, and being a frequent visitor to Bradford - four times a year to see my mother and family - I watched as he created a marvellous atmosphere. Jonathan's generous spirit began to pervade the enormous rooms. I loved and admired what he was doing. I lent him some older Bradford School of Art work, and began a relationship that became a deep friendship. He began to make Bradford very lively - on my visits anyway. He persuaded people to put on theatre and poetry readings. Before long there were shops, restaurants and a clothing company. I shared his view of life. I didn't know much about his entrepreneurial skills, but I realised they were necessary for his vision. Slowly Saltaire came back to being a lively, flourishing place - all because of Jonathan. By 1995, 1,000 people were working there. Of course he knew about publicity and used it with skill (have the stuff on the news pages, not the art pages). His staff, I noticed, all liked him. He behaved with everybody the same way, very polite but warm and cheeky. Often people would come up to him at the mill and simply thank him for what he had created there. Jonathan was always interested in painted pictures. He liked music, so I introduced him to opera (he saw all the operas I had anything to do with in staging). His response was immediate - the large-scale theatricality had an obvious appeal to him. He was, after all, a kind of operatic king. He created his own world, lived in it and shared it with a lot of people. I suppose we both felt the same way about the art world - loving it and also hating it. He knew Saltaire was provincial and the London art world took little interest in it, although a lot of people who were interested in displaying art came to see how he did it, and they usually went away pretty impressed. How he financed it all I've no idea, but for the last 15 years he was my main contact with England outside my family. The marvellous mixture his character was is reflected in the mammoth stones of Salt's Mill and the spirit he has left in them. I will always love him.